The Chicago Department of Transportation has proposed to build the city’s first-ever traffic diverters and bike-friendly speed humps, as part of the Leland Avenue neighborhood greenway through Uptown. The traffic diverter at Beacon will block cut-through car traffic, making Leland a quieter, more comfortable street for bicyclists. Speed humps would replace stop signs, and feature a gentle “sinusoidal” hump – quite a change compared to the “hitting the wall” feeling of the city’s current speed humps. Shaun Jacobsen attended an unpublicized update meeting at 46th Ward Alderman James Cappleman’s office last Thursday, and reported back to us about how CDOT’s David Smith and David Gleason proposed to calm traffic and give priority along the route for bicyclists. All of the proposals are speculative at this stage. The greenway will stretch one mile from Clark Street to the Lakefront Trail, meandering around Arai Campus Park, and using alleys and Eastwood Avenue to reach the Wilson Avenue underpass below Lake Shore Drive. Routing the greenway around Arai Campus Park is a challenge that CDOT sought feedback about during the meeting. Routing through the park isn’t possible, since that would require moving a fence or benches and trees within the park. CDOT continue to welcome feedback, so take a look at a map and offer your route suggestions. To use the alley, CDOT staff said they could add a bi-directional painted bike lane, but attendees expressed concern that alleys aren’t cleared of snow and debris. People also park in the alley, which could block the path. CDOT proposes adding a diverter at Beacon to reroute car traffic approaching from all directions. Leland is used as a cut-through alternative to driving east-west on Wilson near Clark. A photo at the meeting showed a curved, landscaped area with curbs and two central cut-throughs for people bicycling. Jacobsen said that Gleason told residents a diverter “impacts how you get somewhere on the street, not if you can get there” — an important distinction for residents to keep in mind. CDOT also proposes to remove stop signs at Dover, Malden, and Magnolia to improve bicycling efficiency, replacing them with a speed hump design not previously used in Chicago. Jacobsen asked if something else could be done to slow vehicle traffic, like using a raised intersection or staggered speed humps, but was told no, “because drivers will find a way to circumvent it.” The sinusoidal speed hump design, named for its sine wave shape, is used elsewhere in the United States. Bike and traffic infrastructure changes would be paid for by $100,000 of aldermanic menu funds, allocated through the 2013 participatory budgeting process, while the bioswales could be paid for with EPA stormwater management grants or by the Department of Water Management. Two curb extensions with bioswales, as on Berteau Avenue a few blocks south. 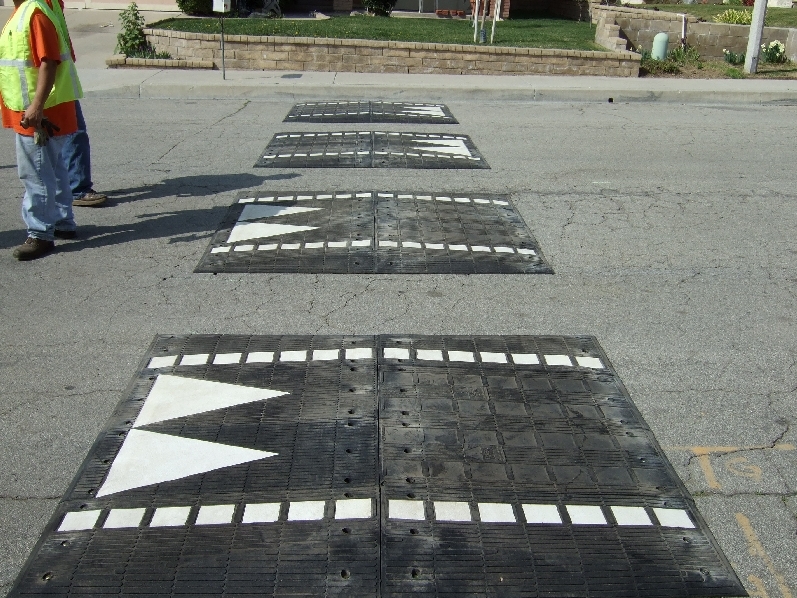 These will reduce speeds, shorten crossing distances, and slow stormwater as it drains to the sewers. A buffered or protected bike lane on Wilson, to connect the greenway to the Lakefront Trail. Between Clarendon and Marine Drive, the lane would replace free parking, while east of Marine Drive, Wilson will go on a road diet and two of the four travel lanes will be converted to some type of bikeway. “Greenway identification” decided by a CDOT consultant, which Jacobsen told us “could be signaled or a distinct style of street name sign along the greenway.” The consultant will “also be looking over all of the city’s bike route signage,” he said. A public meeting will follow. the speed hump on the eastbound Logan blvd access road between Maplewood and Campbell seems like it is accidentally sinusoidal, it is also my favorite speed hump ever. Those speed humps were used 15 years ago in many alleys through Rogers Park and Edgewater. Again, CDOT doesn’t remember what has been done before. It shouldn’t be sketchy because car traffic volume is very low and speeds should be limited. The posted speed limit was lowered to 20 MPH and a couple of things were added (a traffic circle and bumpouts) to make this the design speed as well. Where in Rogers Park? The ones used in alleys east of Sheridan were VERY short and steep, not at all like the ones in the photo above. After several years of delay and significant design changes, CDOT has finally started work on the Uptown bikeway. While the traffic-calmed side-street bikeway is already underway in the 46th Ward, there are currently no plans to extend it west.